Argan oil is a well known natural beauty product that is fantastic for use on skin and hair, but have you heard of the Argan oil that is for eating? There are two types of Argan oil – the difference being in the process. The cosmetic oil (for topical use) is made by pressing the raw Argan kernels, whereas with the culinary oil Argan kernels are lightly roasted before pressing. Culinary Argan oil is a functional food – which means consuming it regularly contributes to good health. It can safely lower blood pressure and cholesterol, protect against cardiovascular disease, cancer, environmental pollution and arthritis and treat chronic diseases like diabetes. It boosts the body’s immune-response and soothes inflammation so it can be considered an anti-ageing formula, both inside and out. It also acts as a digestive aid by increasing pepsin in the gut. The Moroccan berbers living in the Argan regions have traditionally used culinary Argan Oil for cooking and for making the nutritious nut butter Amlou. Culinary Argan is a great drizzling oil. 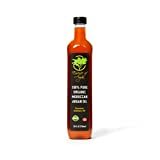 It can be used like other oils, in cold dishes, salads, desserts and some hot dishes, but not for frying because it loses its nutritional qualities when heated and also its aroma intensifies with cooking. Some people find the taste to be a little strong so you should use it sparingly at first. Here are some of our favourite recipes to try when you get hold of a bottle of culinary Argan Oil. If you’re outside of Morocco you should be able to find it at gourmet stores or you might buy your culinary Argan online. I’m thankful to be living currently in Morocco where Argan is easy to obtain, especially since hubbies family are from an area where Argan trees still grow. Simply pour some culinary Argan oil into a bowl and use as a dip with bread. Add a bit of honey if you have a sweet tooth. Drizzle a little culinary Argan oil over cooked eggs – fried, poached, boiled – however you like them. Place some white cheese on a plate (Feta is delicious) and drizzle with culinary Argan oil. You can sprinkle over a bit of Zaatar or some Black Seeds or whatever takes your fancy. In Morocco, Bessara – a hearty soup made of dried fava beans is typically eaten for breakfast during the winter months but it can be enjoyed anytime as a soup or dip. Cherry Tomato Salad with preserved lemons and Argan Oil has a wonderful aroma due to the culinary Argan oil in the dressing and the preserved lemons add some probiotic goodness. For much more information and recipes get your copy of The Complete Book of Argan Oil – ebook or paperback. BTW we hear a lot of mispronunciation of the word Argan (as well as mis-spelling and association with Argon – a gas). So to set the record straight, here is how to say Argan like the Moroccans do. 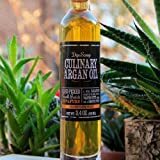 Dip & Scoop, Argan Oil, 3.4 oz.